1. Keeps your gut healthy. Sunchokes have high concentrations of inulin, a non-digestable fiber that acts as a prebiotic (food that the “good” bacteria in our gut loves) in the GI tract. Consuming prebiotic foods is an easy way to keep gut bacteria happy and keep harmful bacteria at bay. 2. Liver cleansing. This root vegetable is high in sulfur containing amino acids which support the livers detoxification process. 3. Blood building. Consuming just a cup of sunchokes can provide you with 25% of the RDI for iron. We need this essential mineral for maintaining adequate levels of oxygen in the blood – a key component in immune health. 4. Stabilizes blood sugar. Sunchokes are filling without spiking blood sugar and keeps blood sugar stable. 5. Hydrating. Electrolytes are a primary element in staying hydrated. Sunchokes are an excellent source of potassium which is a heart friendly electrolyte. 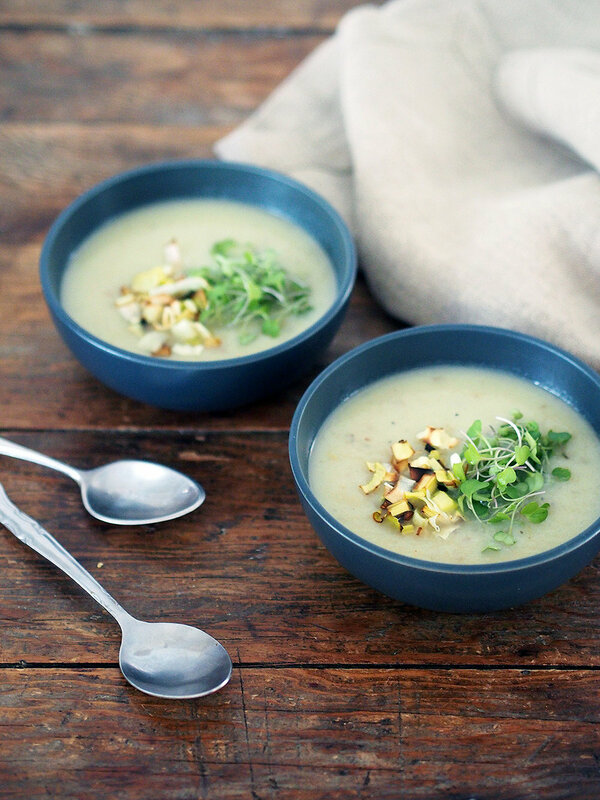 Adding crispy leeks and micro greens gives an extra punch of nutrition and flavor to this nourishing soup. Crispy leeks are so easy to make just be sure to keep an eye on the oven as there is a very fine line between crispy and burnt. Use whatever micro greens you can get. These little greens back a potent punch of chlorophyll and have loads of vitamins to keep you healthy. Don’ be afraid to add a giant handful of these cute greens to each serving. Be sure to wash them well and if possible pick them up from your local farmers market, they will be fresher and last longer in the fridge. Melt the coconut oil in a medium pot over medium heat. Sauté the onion, potato, sunchokes and celery for about 8 minutes or until turning a golden color. Add the garlic and sauté another minute. Pour in the broth and add the leaves. Bring to a boil. Cover and reduce heat to simmer for 25 minutes. While the soup is cooking prepare the crispy leeks. Sauté the leeks in olive oil in a medium pan over medium heat for a few minutes until bright green. Spread them on a baking sheet lined with parchment paper. Pop them in the preheated oven and bake until crispy. Puree the soup with an immersion blender. Season with salt and pepper. Ladle into bowls and top with crispy leeks and micro greens. Enjoy! Soup will keep 3-4 days in an airtight container in the fridge and can be frozen for 2 months.